As a film critic, writer, enthusiast, what have you, I always find it somewhat tricky to write about a film that goes through such painstaking measures in its marketing campaign to keep its plot ambiguous. I can never figure out how to talk about the film while somehow not really talking about the film at all. This is because I hate giving things away and apparently, so does director, Gabriele Muccino. 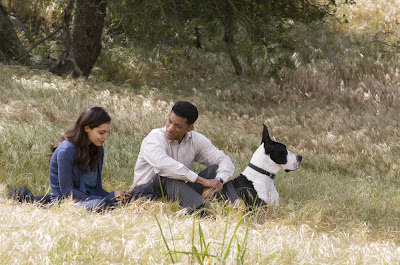 For the first half of the Italian director’s latest Hollywood offering, SEVEN POUNDS, he drags his heels in the dirt, desperately concealing the plot in some failed attempt at being unconventional. For audiences who have been teased long enough with the trailer, being taunted once they’ve already paid for the answers will not go over well. There is a difference between natural intrigue and playing dramatic mind games with the viewer, intentional or not. When it comes to secrets, the important ones are kept without anyone knowing they even exist. Muccino almost seems to be having too much twisted fun dangling this seven pound carrot in my face. And by the time he gives you a bite, you’re not hungry anymore. After successfully pairing with star, Will Smith, two years ago with THE PURSUIT OF HAPPYNESS, Muccino goes for a second round. Muccino works very well with Smith, pulling hard, internal emotions out of one of the most accessible stars in Hollywood history. Smith knows this and it was no surprise to hear they were reteaming. It would seem that Smith makes most of his film decisions these days by choosing characters that are challenging and complicated. I commend him for this and think that, for the most part, he is successful in his evndeavors. However, Smith cannot completely control how his performance ends up shaping the films he is in. 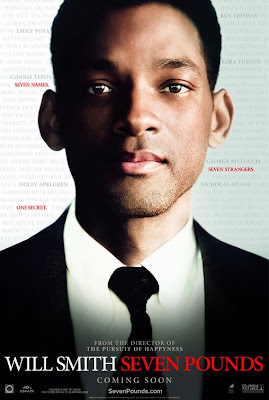 In SEVEN POUNDS, Smith gives a range of emotions – from angry and bitter to gracious and generous. He is always convincing but Muccino takes Smith’s performance and breaks it into so many non-sequential pieces that the energy needed to piece them all together leaves no energy left over to appreciate the whole. SEVEN POUNDS does have one saving grace though and her name is Rosario Dawson. Dawson plays Emily Posa, a young woman with a heart condition and very little time left to live. She also owes an obscene amount of money to the American government. In steps Smith as Ben Thomas, an I.R.S. representative who seems more concerned with Emily’s health issues than her back taxes. Inexplicably, they begin to spend significant time with each other. By the time this happens in the film, you can pretty much figure out what all the fuss is about but their interaction is so intriguing that it becomes a very welcome distraction. Their time together is oddly intriguing. They are drawn to each other and have a surprisingly simple ability to make each other laugh but you can tell that they are both dealing with very heavy struggles that limit their possibilities, both individually and together. It is a testament to healing capacity of the ever elusive emotion known as love. The fragile love shared between Smith and Dawson proves ultimately to be another disappointing element of SEVEN POUNDS. It is so endearing that you wish the film had spent more of its focus there. Instead, it tries to play with you right up until the very end. If I am to be toyed with for such an extended period of time, I expect a pretty big payoff when I get what I’m due. Only the big reveal in SEVEN POUNDS serves solely to expose how conventional it truly is and how it wants to be heavy but is essentially as light as its namesake.